Wicks in stock all year round! "About us" - Selected customer feedback. << wicks by heater & model number in the column at left. "Breathe Easy" Platinum Catalytic Filter are all gone, sold out. how you ever got along without one! Pretty pictures and form to keep your wick records. Mail Order form - large or overseas orders. One page Mail order form for small domestic orders. to see the current temperature in many locations. Wind direction and speed for the continental US. Care and Maintenance of Kerosene Heater Wicks BURNING THE WICK "DRY"
I have had many reports of flame "dwindling" or poor performance of heaters. This is caused by poor capillary action, the result of water in the fuel: It only takes a teaspoon of accumulated water to saturate the cotton lower portion of a wick. Click here for some information or for a more complete explanation click here. Kerosene Heaters - General types, how they work, recommendations for good ones - and those I would avoid. Radiant and Convection heaters. Beatrice Boiling Stoves & Mini kerosene heaters, some you can make yourself by modifying a brooder heater. Click here as there are so many they need their own page. Auto Motor Heaters - operating instructions I made from an original brochure. Bunsen-Davy Motor Heater, thanks to Charles Crouse. US Stove Co. #89P Owner's Manual - a .pdf download provided by customer Johnny. Perfection 300/400 Stoves and wicks. Perfection 441X Giant Wick Installation and the wicks! GSW Hot Blast Heaters made in Canada. Haller Saffire Owner's Manual, in British English. POD Jr. - 3k/7k Military heater made in Sweden. Photos and wick installation. Koehring radiant heater. Excellent owner's manual for all heaters using wick #16-2P. Wick #15T & #16T replacement Instructions. Wick tool photo - the wick tools are not available as they were supplied with the heater: the wick can be installed without using the wick replacement tool. 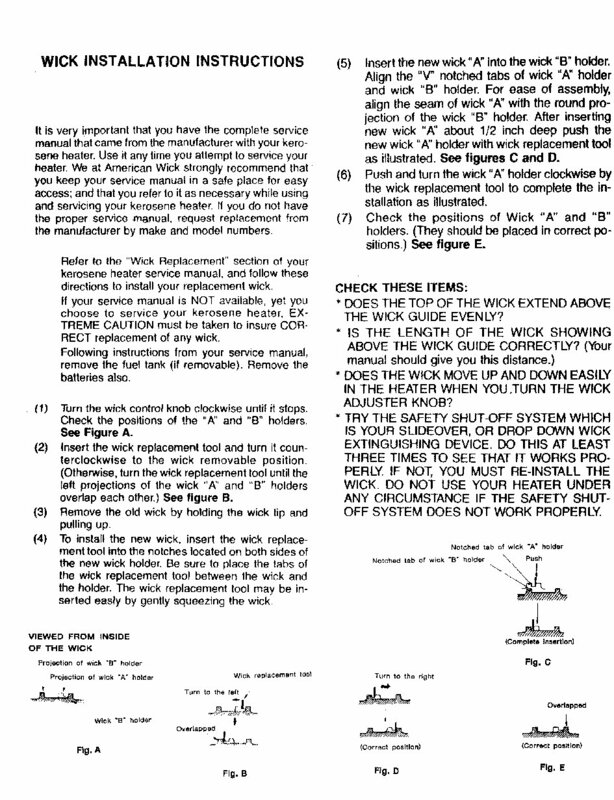 Wick #15T & #16T replacement Instructions. Wick #20 installation instructions. Also applies to #20A, #20B and many mechanical wicks such as wicks #34, 35, 36, 38 and #38A. St.PaulMercantile.com is the source for Butterfly stoves and pressure lanterns. Building a Versatile Cooking Stand for kerosene stoves. also mini stoves made from old brooder lamps. examples of, and wick replacement. Wicks are here. and the kindler wicking for them. All information kept strictly confidential. Postage is added per the amount of purchase. For US delivery, up to $18.00* is $4.95; usually two heater wicks and an igniter are mailed for a low $5.95 postage. First Class (up to 13 oz) or Priority Mail. Postage prices took a huge leap on Jan. 18, 2016, especially for packages and wicks are shipped in packages. Packages weighing 13 ounces went up $2.00 in cost! Anything over 1/4'' thick must now be sent at the package rate, and now all packages weighing 8 ounces or less are the same postage cost. It now costs as much to mail a 1/4 ounce igniter as it does a heavy wick! I had held the line on what I charged for postage delivery for 10 years but this postage increase was just too much and I had no choice but to raise prices. Orders with merchandise weighing over 13 ounces are sent via Priority Mail. To upgrade a wick order from First Class to Priority Mail delivery, click the Add to Cart button below. PRIORITY MAIL upgrade for orders under $50.00. Priority delivery nationwide usually in 2 days. FOR US DELIVERY ZIP Codes only. * I mail virtually every day from Oregon, USA, and delivery is as fast as I can make it happen via U.S. Postal Service 1st Class and Priority Mail. Orders received before noon PDT are shipped that day, including Saturday, except under the most unusual circumstances. No shipping on Sunday or holidays, of course, because the Post Office is closed. ** Wicks are gladly mailed mailed to Europe, Australia, New Zealand, Japan, South Korea, Viet Nam, etc. - ''worldwide'' with some obvious and necessary exceptions. I will only mail wicks and other items to countries which have reliable mail delivery. Some countries have a horrible delivery percentage and I will not ''give'' free products to thieving postal and customs employees. The countries to which I WILL NOT mail products include Indonesia, India, any Persian Gulf or Middle East country except Israel, and no country on the African Continent except Namibia. International addresses should be coded with Latin characters. Our labeling system cannot process different encoding like Cyril, Hebrew, Arabic, Japanese, Chinese, etc. An e-mail confirmation is sent for each order received. If the cart window is open, you cannot add any products even after clicking on "continue shopping." POSTAGE RATES INCREASED SUBSTANTIALLY IN MAY, 2018, ESPECIALLY FOR PACKAGES AND OVERSEAS SHIPPING. Click here to see postage rates. CUI is an American importer of heater wicks. CUI has import rights for wicks made by Hattersley in England. CUI also imports wicks from Korea. I reserve the right to substitute other brands of heater wicks where I have found them to be of high quality and value, such as original (OEM) Aladdin Blue Flame and Valor heater and lamp wicks. Yes, I actually test wicks before I will stock and sell them. I return batches of wicks which fail to meet my standards. In the summer I am sent wicks to test by manufacturers before they make the next winter's wicks. If necessary I have wicks made to my specifications. I have many rare heater and lamp wicks made for me, and if the demand is too low to have a production run made I may make them myself. Hattersley is the manufacturer of OEM wicks for many brands of heaters for Europe, including Toyotomi (KeroSun, Zibro) & Corona., and made to the highest UL Standards. Hattersley, Aladdin (UK) and Valor are sister companies. Hattersley makes the World's most comprehensive range of wicks for modern and antique kerosene heaters and lamps. 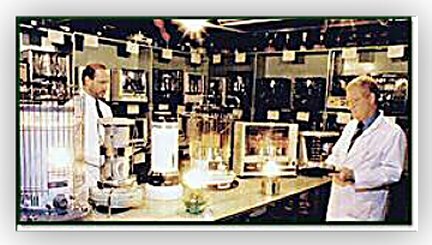 The company's dedication to progress is exemplified by its wicks development laboratory/testing room and wick library, which Mr Woodyatt established within the factory in 1992, and has been used since then to develop their products to the highest possible level. EMAIL: SORRY, THE WICK SHOP DOES NOT HAVE FACILITIES FOR WALK IN CLIENTS, BUT OUR WEB SITE REMAINS OPEN 24/7 TO HELP YOU. I ANSWER QUESTIONS AS QUICKLY as possible (via e-mail, not telephone) to help with problems. I ship via USPS every day about noon, so even orders received up to 11:00 AM Pacific Time can receive same-day mailing - I give you the best possible service I can provide. If you have questions about my wicks, your heaters or lamps, please e-mail me at Miles@ruraloregon.net - I am your tech support. I do not have a store – I just sell online. I’ve been selling kerosene products, mostly wicks, since 1999. Virtually all of my wicks are made by the best wick maker in the world, Hattersley in England. Wicks are made to my specifications and tested in my own extensive collection of heaters, lamps and stoves. I keep all wicks in stock all year for those who want to be prepared for winter in advance. I ship wicks worldwide and in fact have the best list and selection of wicks for heaters sold in Europe, Australia and Scandinavia. In 2005 I noticed that except for Rayo lamps, wicks for center draft lamps had not been made since before WW II. I purchased many Victorian Era lamps of various sizes, measured original wicks, tested new wicking for diameter, thickness and capillary action, and had the full range of center draft wicks made by Hattersley in England. Proper Victorian Era center draft chimneys had not been manufactured since the Depression, so after considerable testing I had the best samples replicated in borosilicate glass. Student lamps made from 1875 through WW I did not have good chimneys available, so I had them made. Kindler wicking for gravity-fed stoves made by Boss, Florence and many other stoves from before WW II had not been readily available so I carry the full line of kindler wicking. By 2008 I had more information on kerosene stoves, heaters and center draft lamps on this website than all other websites in the world combined and was the largest independent seller of kerosene heater and center draft lamp wicks in the world. We have worked very hard to earn your trust and respect. We still work seven days a week processing orders. Every order is acknowledged upon receipt. All orders are shipped every day except Sundays and holidays at noon and delivery information and a tracking number sent to your email address - there are no delays in shipping orders. Your wick for my OR77 arrived today. Super fast service even given the Thanksgiving holiday! When I opened the package I could immediately see that your wicks are far far superior to the other 2 purchased online from other vendors that have been total failures. And I do mean TOTAL failures. Your wick appeared to me to have about double the material in it - especially the fiberglass top ring. So, I installed it in this cute little P. I. T. A. heater. It has never ever worked properly from the day I purchased it brand spanking new. I let the wick stand as installed in the fuel sump for a half hour or 45 minutes then lit her up. SURPRISE! It lit instantly and turned the globe red within a few minutes - no smell, no smoke, no hastle, no pops or whistles. It just burns and burns right. So, thank you again for both your website and great information, plus also your very high quality products. Funny thing is, your quality wicks are actually no more expensive than the other junk I've been unwittingly buying online from other sources. I wish I'd known about you from the start. Two piece wick received in good order yesterday. Thoroughly cleaned everything including both tanks in advance. Wick installed and heat output back to new for 30 plus year old heater. Most amazing part is how freely the mechanism works with the new lower wick (15-2P). Thanks again for your excellent service and information on web site. I just wanted to thank you. My success oil lamp is working beautiful thanks to both the information on your site ( on dismantling stuck wicks) along with the new wick and installation sheet. Thanks again K. Spares, Nova Scotia. now it burns with a perfect safe blue flame! Paul in PA. Miles, I received my wicks today (post office had a delay or they would have been here yesterday). I changed one and noticed immediately the difference in quality. I have used Kero World wicks in the past, the last was a total disaster! Each time I changed a wick I noticed that it just didn't fit quite right, it took quite a long time to get the wick to lay flat. They just seemed to be a tad too big for the sleeve. The wick I got from you fit perfectly, it was a breeze to change. I am so happy I decided to purchase our wicks from you. The price was hardly any different from the others. I will be purchasing more from you for sure! Thank you! Your website is perfect – accurate, precise, informative and truly helpful. tracking numbers and links exact and easy to navigate. recommend you to anyone I know for their kerosene heater parts and supplies. Only one week to Sweden!! I am in receipt of your mailing of my wick order. Thanks! Subsequent to my first order from you, I tried other various manufacturer's wicks. All paled by comparison. That is to say the longevity was less, the capillary action (material/construction) measured relative to a digital thermo reading taken @ both the flame and the lantern housing top was less and overall performance was not as great. Yours are truly superior. I can say that as a Chief Engineer with over 35 years experience. I'm a hands on guy who isn't easily impressed. R. Rosati, NH. This website had exactly what I needed. It was easy to navigate, the customer service was great, and the shipping was fast. I highly recommend it!! Patrick in NC. Miles, Once again thank you for shipping my order to me in record time. I will continue to order my lamp and heater supplies from you. I installed the catalytic filter i recieved from you on my heater. Also i installed a new wick. What a difference the catalytic filter has made. Now when i go in my garage there is no odor as if a kerosene heater is lit. You smell nothing. I think i will order 2 more for my other heaters. For someone with sinus problems or breathing problems like i have this is the way to go if you have a kerosene heater. Now when our power is out and we need emergency heat in the house i can rely on my kerosene heater to keep us warm. Received my wick that I ordered in the mail today. Thank you for the prompt service of less than one week delivered and for your reasonably priced excellent product. Frank in Chilliwack BC. Thank you for the swift delivery of my new wick for Ruby KSP 270. Only seven to eight days and all that way to UK and all!. You have a great site and a pleasure to visit for us Paraffin fans. I shall visit again sometime soon. Meanwhile, thank you again and best regards, George. Norfolk UK. Outstanding service and quality wicks. Product ordered Feb 2, 2012 item received Feb 10, 2012. Wicks were securely packed and they work great! You are my go-to kerosene hearter parts guy from now on. Thanks very much. Jeff - Toronto, Ontario, Canada. I got your delivery in great time. The wick is perfect and installation was easy with the enclosed instructions. You do NOT receive enough positive feedback on how wonderful your site is. I have been looking for a new wick for my Kero-Sun Moonlighter for two years. I bought the heater in 1980 and have not used it since 1985. Shopping at big box stores and small hardware stores for a replacement wick was useless. I didn't have enough information about my heater to be able to choose the correct wick by simply reading the information on the packages. However, your site showed me pictures, had the owner's manual and carefully explained the different model numbers and types of wicks. I just ordered the wick today and I'm confident that when it comes it will be the correct wick and will light my stove with the loving glow it had 30 years ago. Thanks again. T. Hicks, MN. Just wanted to email a quick thank you for your quick and efficient service. You shipped quickly, had an accurate and fair shipping price for me in Canada available immediately, and the item arrived as described and properly protected. I will be doing business with you again soon, and will send those from my former military, and now Firefighting, circles to you for for what you stock. Thanks for the fast service on the wick I ordered. Please folks if you have or are considering any kerosene stove, heater or lamp look at this website. Instructions on use, care and maintenance are invaluable and free. This has been a great help to me to find the products and information at what has to be the best website EVER, along with great wicks at fair prices. I purchased two wicks from you for my Kero World heater and my what a difference. Yours burn better than those I used to buy at the Wal Mart. My old wicks I would have had to burn dry twice now since I installed them, but I haven't burned this wick dry yet because I haven't needed too. Great products that I will be purchasing from you here out. Many thanks! Excellent service!! Of course with the largest snow we've had in years both of heaters were out of commission. I ordered wicks on Saturday and on Tuesday I have them in my hands! Thank you for your great service, and for such an information packed website! That was quick delivery – my order arrived yesterday! I’m writing today because I had some time to fit the new wicks into my lamps this afternoon. This is my second order from you and I’m very, very pleased. I had trouble finding the right wick for an older B&H, but the one I got from you fits and works perfectly. Thanks to your descriptions that include both dimensions and make/model references, I confidently bought wicks for a Pittsburgh Success and P&A. Maybe 100 years ago when these lamps were in common use, “everyone” knew how to fit and trim a wick and what kind of fuel to use. With your helpful advice, I’m putting my lamps to use fully confident that I’m doing it right. Didn’t know how long it would take to receive them, but we got them from Oregon to Indiana in less than 48 hours from the time we ordered them! Reasonable price, reasonable shipping, Outstanding Service!!! Hi Miles. Do you have a special in with the USPS? I ordered the wick & chimney on Saturday morning, and it was delivered today, MONDAY. You and the USPS are the pinnacle of service. BTW, The chimney is beautiful. I'll send you a picture when the Dresden is up and running. I ordered my wicks and igniter on 11/22/08 and received today 11/24. First of all, thank you for the super fast delivery, I am truely impressed and shocked that such service still exists for online businesses. I have been purchasing wicks for my Dura Heat kerosene heater from a large local retailer since they were cheaper and carried the same wick as 3 other retailers in my area. I have "burned up" 2 of their wicks in just under 6 weeks. The wicks burn up so fast while never operating properly from first installation. The height adjustment was always sticking, especially when pressing the knob to "turn off" the heater. It never once went completely down on either wick (nor could I get it to go any lower) causing the wick to burn for about 30 - 60 seconds before going out completely. After only 3 or 4 burns on the new wick, it was a major chore to get the wick to even raise without catching on something whether due to the soiled wick or bad fit. The first time I used up a wick, I thought it was something I had done wrong... whether it was the installation (even though it was a pinned wick) or the wick height while burning. I looked into the problem online and was reassured I was following proper methods for installation and burning. I found your site in my research and read about the fiberglass top and cotton bottom wicks. Since I had "burned up" the other wicks so fast, I was sold when I read about the nonburning fiberglass. I was truely impressed with wicks when I took them out of the package. The superior quality was obvious as soon as I put it in my hands. After getting the new wick installed (exactly the same as the other wicks I installed) It worked flawlessly. No hanging or sticking and when I lit it for the first time, it was very clear that I made the right choice purchasing from you. I am generating a very noticable amount of more heat with the new wick which will save me money. I wish to leave you "Feedback" like we do on Ebay... I can't believe just how fast you got this purchase to me. I ordered it on Saturday... and there it is in my mailbox on Monday ... WoW.. And thanks for using the Postal Service for your shipping needs. Wm. (Rusty) Crist Lynnwood Washington. pass your name along to anyone I know who needs your products. Thanks. I order a wick from your store on Saturday, January 26th. I received it on Monday, January 28th. I live just outside Atlanta. Thanks you for the excellent service. I installed the new wick and all is well. Keith M.
This is the second order I have made with your site. And, for the second time, I was very pleased with both the quality of the wicks and the speed with which they were delivered. My thanks to you for the excellent service!! Hi, I Recently Purchased One Of These Heaters, The Wick That Came Installed With The Unit Was Virtually Worthless ! Had To Raise It Daily, Take Apart And Reinstall It Higher Every Three Or Four Days,. It Just Kept Burning Away. I Recently Purchased Several Replacement Wicks From You, Installed One In The Heater, And It Now Burns Flawlessly, No More Daily Adjustment, No More Taking It Apart To Raise The Wick. I Don`t Know If It`s Possible To Make People Aware Of This In Todays Legal Climate, (Lawsuits, Etc.). Just Wanted To Let You Knqw That You Ara 100% Percent Right When You State All Wicks Are Not Created Equally. 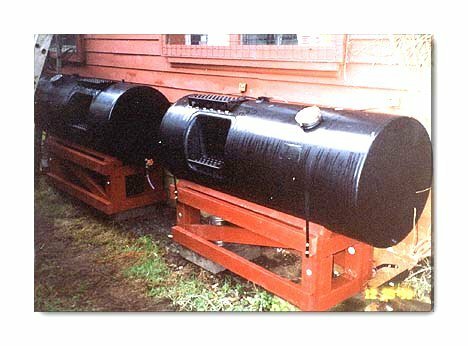 I`ve Been Running Various Kero Sun Heaters (Stating In The Fall And Burning Continuously) For The Entire Winter (Long And Cold) For At Least Fifteen Years, In Northern New York. This Heater Works Great ! Just Thought I`d Pass Along The Info. many thanks for your great service! I ordered the Wick on Oct. 3th and he arrived me at Oct. 8 th. Less than a week for the US to Germany! Got the blue flame wick in record time (one weekend!). You have my wick business from now on. At least there is somebody still honest out there on the web that I can count on! Scott in NY. Hello.....just wanted you to know what an excellent experience shopping with you has been. The site is superb.....easy to navigate....paypal is such a plus.....and the package arrived long before I had anticipated.....in perfect condition. Such a positive on-line shopping trip.................thanks.......dawn (in PA). Just wanted to say your service is unbeatable. Ordered on Saturday, received on Tuesday, in NY! And with the best price, I will be a repeat shopper. surprising is the fact that the USPS does have a Priority Mail service! got here. And you are an incredible source of information. Again thank you. PS: Your may use this on your site if so inclined. Sam here in Sierra Vista Arizona, Many thanks for the quick response and excellent service in filling and delivery of my or for two wicks for an old 500 model kerosene burner. Just letting you know that some of us out here appreciate it. Again, thank you. Doing business with the best is really a blessing. Thanks Miles-- The wick arrived this morning, which is about the fastest service I've seen. Two day delivery across the country! Leslie in CT. Thanks for the prompt and curteous service and your gift! Beats the hell out dealing with Wal mart. Tony G. in Newfoundland. Merry Christmas! I ordered two wicks from you for my Corona DK23 - an absolutely perfect fit. After wasting my hard-earned cash at Home Depot and Lowes for wicks that SHOULD have fit but didn't, I stumbled upon your web site and I'm sure glad I did. I spent two hours trying to jam a wick in my DK23, I was covered with K1 and aggravated like you wouldn't believe. I tossed it in the garbage in disgust. Maybe that was a Godsend, as it probably would have been dangerous if I had managed to make it fit. Your wicks came this afternoon, and I REALLY appreciated the instructions for the DK23 that came with the wick. It took me ten minutes and most of that was just cleaning things up. I hope you stay in business for a L-O-N-G time, and I can guarantee that you'll get my business in the future. My regular heating system is electric, and you can never guarantee that the juice will be there when you need it. The 23DK can heat my entire house, and it's not a small house. Even the folks who have oil aren't safe - if the electric goes, the blowers are inoperative. Kerosene isn't cheap this year, but the DK23 puts out a LOT of heat, and we love it. I feel much better now that I don't have to worry about where the wicks are coming from. AND... your web site is wonderful and informative. Feel free to use me as a reference - a VERY satisfied customer. Thanks again for your great service. Peace to you in this Christmas season and our best for a prosperous and healthy 2006. I had to write to thank you for such wonderful service!!! I'm very impressed with the quick delivery!!!! The new wick arrived today and is installed. It works better than ever! I'm keeping your business in my reference folder for future purchases. Thank you so very much! Merry Christmas!!! My wicks arrived today and I installed one in about 30 minutes . . . the instructions were very clear and easy-to-follow. Now my heater is burning brightly and more cleanly than it has in years. I was surprised how badly the old wick looked when I removed it. Many thanks for your swift and courteous service. #1B, #1M, #1R, #1S, #2M, #2L, #2R, #2 P&A, #2B, #3L. Lamp wick by the roll, foot or package, 1/4'' to 4 1//2'' wide. + round wick fiberglass wicks. Kosmos Lamp Wicks & Chimneys, history, photos & information. Kindler Wicking for stoves and heaters, 3/4'' to 1 1/2'', 5 1/2 foot rolls. Standard glass lamp chimneys, Kosmos and Angle lamp chimneys.